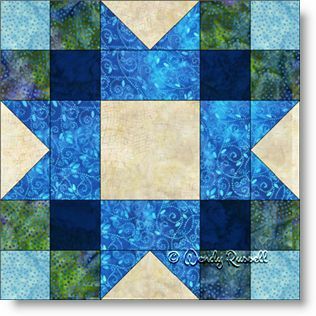 The Maple Star quilt block was new to me. I was pleasantly surprised at how pretty it turned out. It is an easy nine patch block comprised of simple shapes -- the square, rectangle and triangle. The flying geese unit in the quilt block is the one that composes the star in the title of the pattern. The two sample quilts shown both use an "on point" setting with sashing. However, the difference is whether additional half quilt blocks were used, as in the example on the right. As you can see, the effect is very different.